We would visit one last theme park on our Rock n Roller 16 coaster tour of America. It would be Wild Waves and Enchanted Village just outside of Seattle. It is the only theme park in the Pacific Northwest and one that we had to visit for sure. 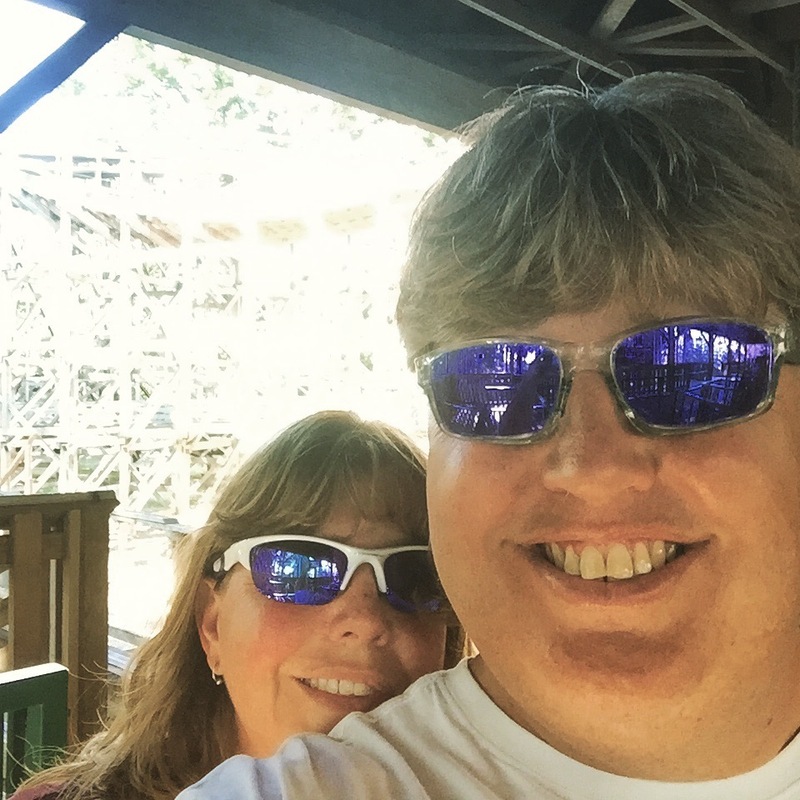 Both Michele and I are members of the America Coasters Enthusiasts club. Yep, a club for coaster geeks, and this was technically our ‘home park’ since we reside in the Northwest Region. We would be meeting new friends, Lisa and Ed at the park. They are also ACE members and Lisa is the representative for our region. Lisa and Ed scored us free tickets and we met in the parking lot. It was a beautiful day and the park was full. We immediately headed to the back of the park and rode the Timberhawk Ride of Prey roller coaster! 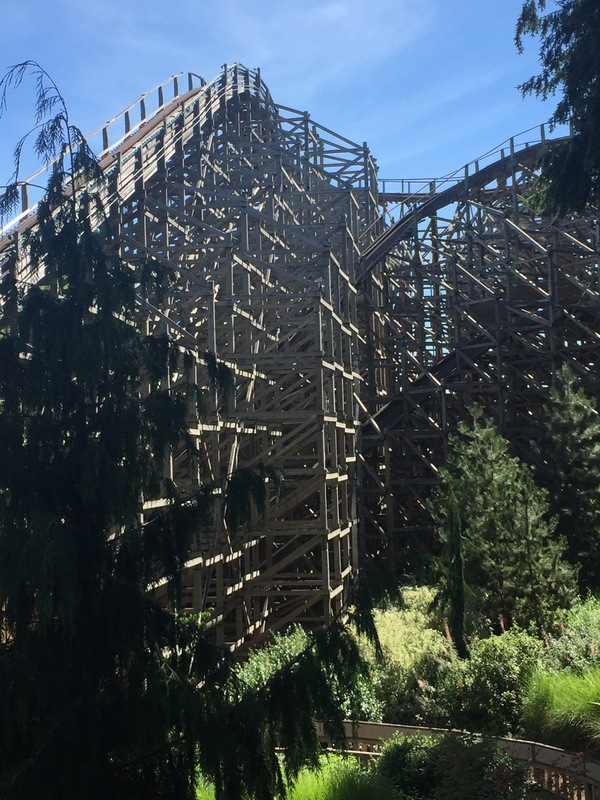 It is the largest wooden roller coaster in Washington State. and it was a great ride. We ended up riding it three times. Twice in the front and once in the back. 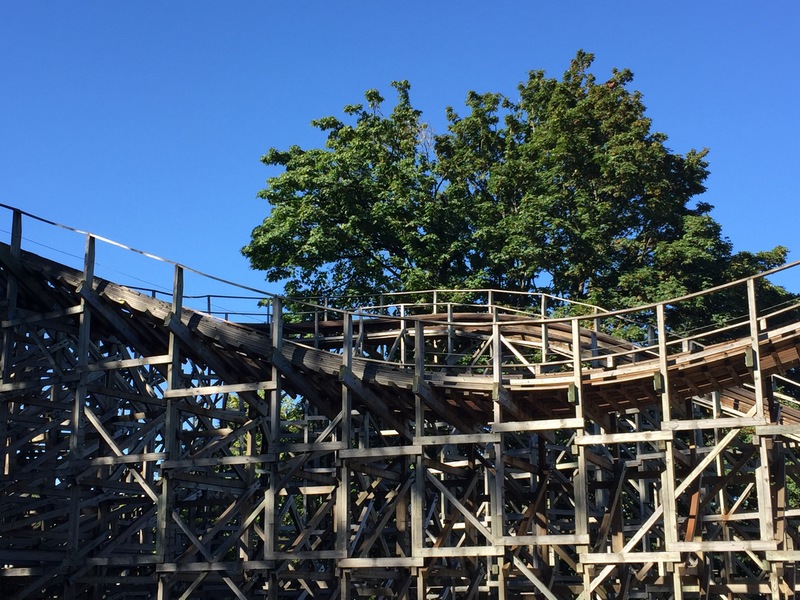 We then headed over to the Klondike Gold Rusher. Michele and I rode in one car and Ed rode in another. Remember how I said earlier in the tour that people sometimes “pad” their coaster total? Well, this is one way to do it and I guess we are guilty. It was set up sort of like the old Mighty Mouse-type coasters where your train car goes one way and the track goes the other around then turns. These types of coasters are always fun for us, Michele laughs the whole time and makes silly sounds! We next headed over to Wild Thing. 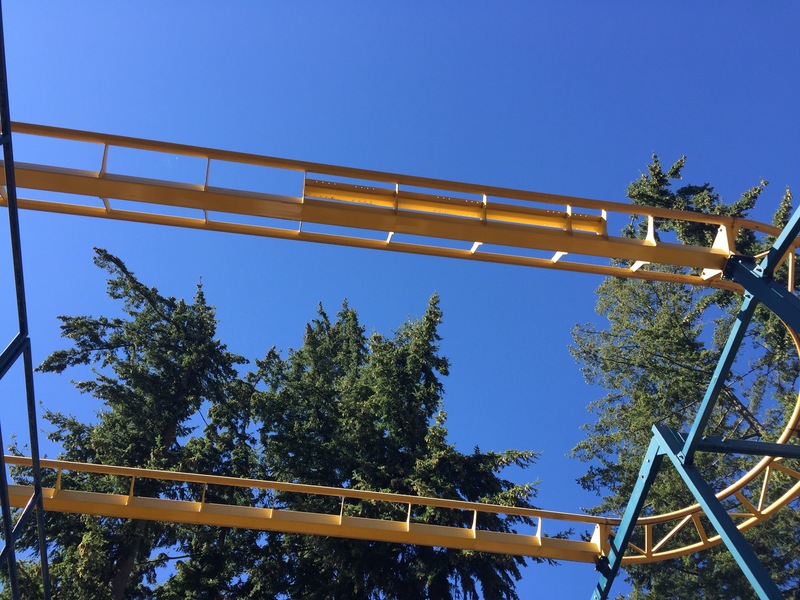 This is an older coaster built by Arrow and dates back to 1984 when it opened at Rocky Point amusement park. It was sold at an auction in 1996 and moved to Wild Waves & Enchanted Village a year later. We waited forever! Lisa and Ed decided to sit this one out as well but even with the long wait it was worth it because you get to go twice! 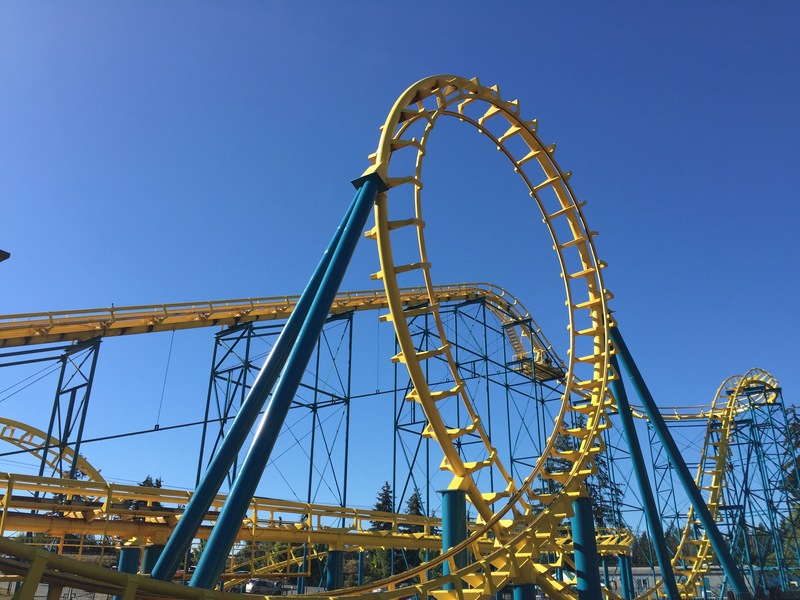 The Wild Thing with its loop-de-loop and two corkscrews is guaranteed to raise your heart rate. As if one trip around wasn’t enough … The Wild Thing goes around twice. “When you go upside down, keep your eyes open and look straight ahead, so you don’t get dizzy,” advises our big kid reviewer. The Disk’O Flashback won’t remind you of John Travolta or the Bee Gees, but it may make you dizzy as it spins on its half-pipe track. We ended the day riding the carrousel. This is an old one, from 1906. Michele and I love riding old carousels. One of our favorites was on this tour at Six Flags America near Chicago. Our rabid readers will remember seeing the picture of this one, a double decker that we rode on the top! It was a great day at the park and great to meet new friends, Ed and Lisa. we promised to keep in touch and if we are ever in the area to look them up and head to the park together. Previous Rock n Roller 16: You’re in the Jungle, Baby! Next Rock n Roller 17: On the Road Again!